We jumped into the open beta of CD Projekt Red’s newest title, a free to play card collecting game called Gwent, originally a mini-game from the developers’ single player game “The Witcher 3: Wild Hunt” in which players could challenge different NPCs to a game of Gwent. So popular was the game that fans begged the developers to create it as a standalone game, and so here it is. 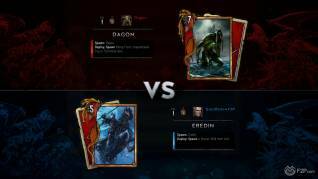 We put a few hours into the game, focusing primarily on battling the AI Challenges trying to get to grips with the game and snag a few extra cards, and we have to say that we were extremely impressed with the unique gameplay that CD Projekt Red have concocted. 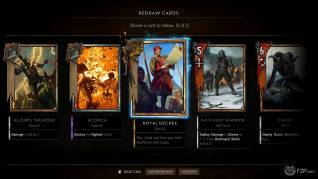 Whilst in many ways Gwent is a typical card collecting game, where you build a deck from the hundreds of cards divided between the five key factions, different cards have different abilities and the game comes complete with a deck builder and the facility to construct your own cards. 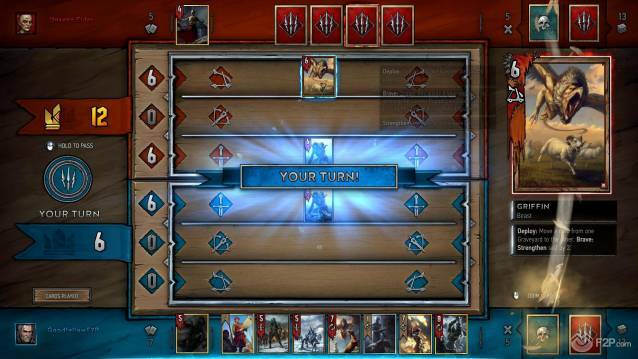 It’s pretty standard stuff for a CCG now and almost a necessity to have these features; the actual mechanics of Gwent though are, and we’re not exaggerating here, pretty unique. To begin with the aim of the game isn’t to destroy your opponents boss/champion/god/general or whatever other primary unit with hitpoints that there is; the aim of the game is to increase your fielded armies Power score. Power comes from the value on the cards that you have in your deck, the current Power of a fielded army is based on the cumulative total of all the played units from your hand, which can be increased with various buffs or lowered by enemy debuffs or by a card being destroyed. Unlike other CCGs cards don’t have a direct “Attack” value, some do deal damage but this happens the moment a card is played; once a card is played then you don’t typically get to do anything with it on subsequent rounds unless it is manipulated in some way by another card’s “Special” ability, pretty much its trait and in general most cards have one that have many of the same kinds of effects seen in other CCGs. 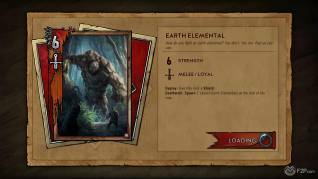 We will say that the wording on some of the Specials was very confusing to start with and there were a few cards in our main deck (Monster faction) that we couldn’t work out how they were supposed to work; outside of this most stuff that was initially confusing was made clear after a couple of games. 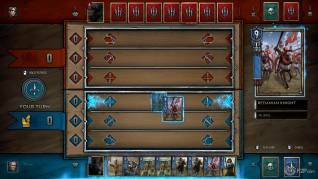 Outside of the Power and Special abilities each card has a unit type; Melee, Ranged or Siege, which determine which row it can be placed on your side of the battlefield; the rows matter as certain abilities will affect all the cards on a specific row. As well as this cards are categorized into Bronze, Silver and Gold, with Gold cards being the best and invulnerable to many Special effects and making it so that can’t be targeted by Special abilities; it also determines how many of these types of card you can have in a deck with only 4 gold cards and 6 silver cards being allowed in a deck, as well as not allowing any duplicates, whereas Bronze you can have multiple copies. 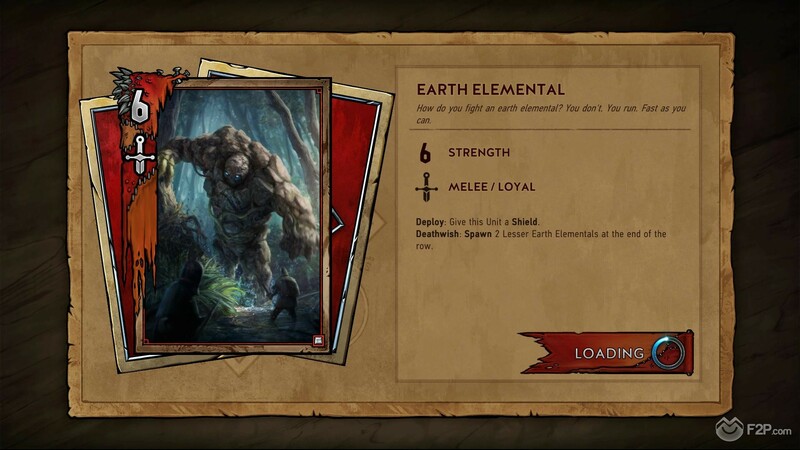 Another unique element is that you only play one card per turn, so no resources spending or building, no waiting until the end of the game to drop your biggest baddest card (though you should probably hold off on placing one early as there’s plenty of cards to instantly kill them). Players keep playing a card until one player either runs out of cards or they pass. 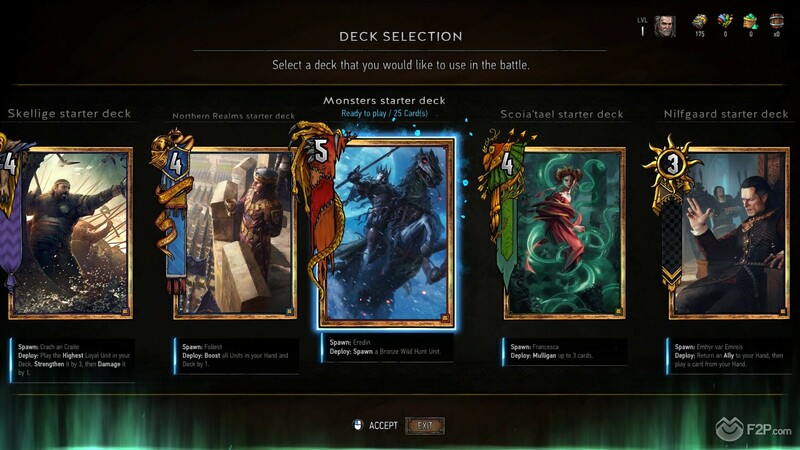 Now something worth mentioning is that when you begin you start with 11 cards in your hand; 10 randomly drawn from your deck (min 25 cards, max 40) and your leader card that can be played once and has a powerful Special ability. 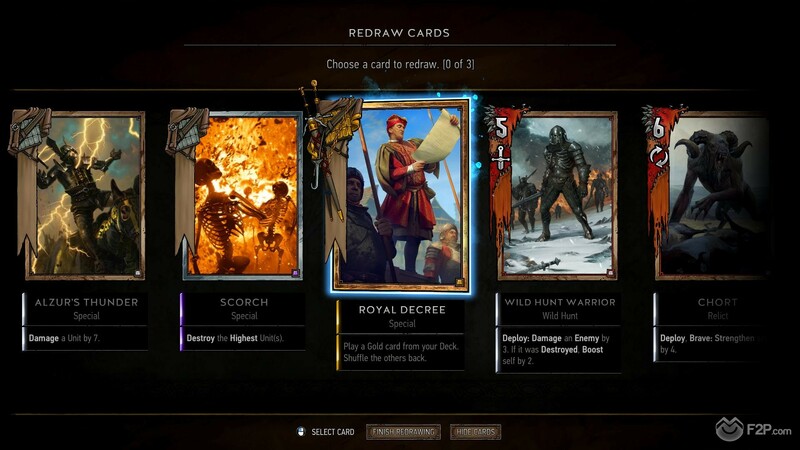 You DON’T draw new cards each turn, so the 11 cards that you start with are basically what you need to win with, and so it’s very easy to run out of cards if you’re not careful. 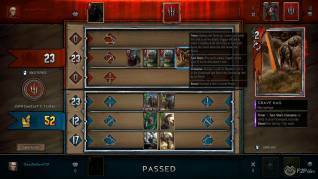 You DO however draw additional cards in the next rounds, yep, Gwent matches are a best of three rounds! So in the next round you carry over any cards you have remaining from the previous round, and draw 2 new cards for round 2, and then draw 1 new card in round 3, this is important as if you feel like your opponent has played some of their best cards and built up a lot of power that you can’t easily match, you could “Pass” (which means you play no more cards but the opponent can play as many as they want, essentially letting them decide if they want to win the round), and instead choose to forfeit the round to then be in a stronger position to win both the second and third round. Finding the balance of how far to push that first round is probably what we found to be the most difficult. Playing the Challenges, battling against a specific deck with a key Boss card as your opponent, we got to experience at length one of the final unique elements to the game; weather. 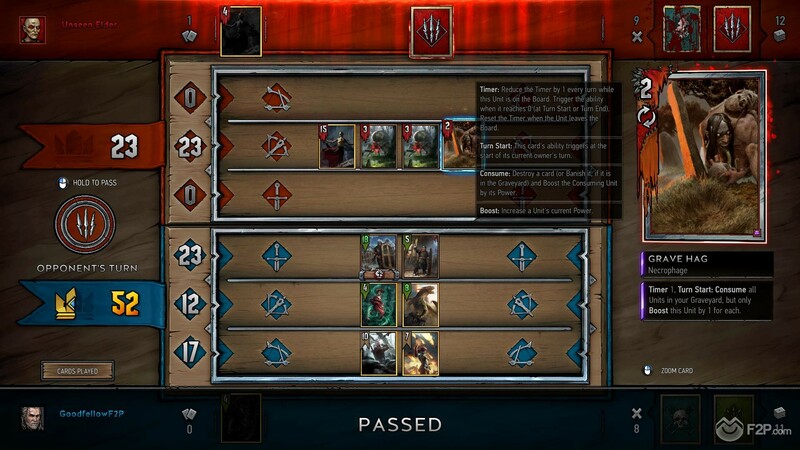 Certain cards can summon weather to a specific enemy row and have different effects on the cards placed there, such as Biting Frost that reduces the affected card’s power score by 1 each turn (if they reach 0 they are removed from the deck). With our Monster deck we also had cards that benefited from these frost effects, such as Frost Giants arriving on the board more powerful is there was any frost on the battlefield. For our challenge we constantly suffered at the hands of Foglings, with our AI opponent constantly putting down fog weather which increased the Foglings power each round; it was an absolute pain to try and deal with but further enhanced the power of this feature. The game itself is a really innovative addition to the CCG genre and steps away from the same copy-paste mechanics and playstyle we’ve seen from other CCGs in more recent times. 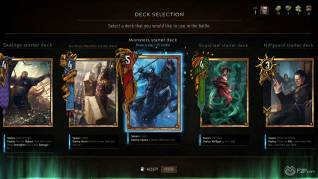 Gwent is going to be a hit not just with the fans of The Witcher, who will appreciate the lore, tips of the hat to stuff from the games, and general revival of their beloved mini-game, but also to players who just like good card strategy. As a novice to the game it took a while to get used to, and to learn what our assembled decks were supposed to do, but the learning curve isn’t too steep to get a handle on the game and the rest is just learning as you go!